This collection offers the reader communion with moments of revelation—spiritual awakenings that arouse the soul. They are moments experienced through touch, personal reflection, self-acceptance, gratitude, laughter, celebration, and empathy with others. We are restored to wholeness as we become aware of the wisdom of our breath, when we are fully present to the moment, or receive the vibrant reality of another being, and when we touch and are touched lovingly. The heart breaks open as it is moved by joy and sorrow, as it expresses gratitude for the good in our lives, as it forgives itself and others: each of these cleanses the soul, like the earth after a heavy rain. The photographs were made in a variety of settings: therapeutic, religious, and medical, and include key moments in the human life cycle, such as birth, illness, loss, joy and meaningful friendship. We encounter a lone nurse communing with a newborn; a doctor soothing a traumatized child; a disfigured woman receiving a priestly benediction; a post-surgery cardiac patient overcome with gratitude. And in other moments, a psychotherapist provides unconditional acceptance to her client; a wheelchair bound woman at the beach greeting the sky with open arms; and a home-care aide reassuring an elderly Alzheimer’s patient. Why make these photographs? 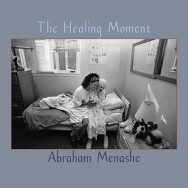 Because I am profoundly touched by how we attend to each other’s wounds—how we give to and care for one another, and decided (early in my career), in a world in need of affirmation, to mine for images that illuminate and enlighten—images that comfort and sustain, images that bind us to one another. To affirm is to validate humanity, to say YES to our existence. This validation is at the heart of the healing image. The healing image exudes grace and warmth. It is an object of contemplation, an icon that embodies the inner truth of things. In Thomas Merton’s words, it is “the highest expression of praise and worship” and cannot help but be an offering, as a testament to life and goodness. With these fifty photographs we come face-to-face with private moments meant to be witnessed only by visiting angels. In the serenity of each moment, we discover that our essential core is peaceful, that life’s treasures are not found in the knowledge or assets we accumulate, but in the love we freely give away. Heal yourself and you heal the world.